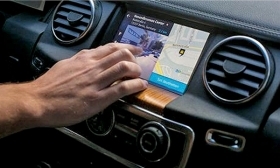 Here has funded its work on three-dimensional maps by selling traditional navigation maps to automakers. FRANKFURT (Reuters) -- Amazon is in talks with a consortium of German carmakers about taking a stake in high-definition digital mapping company HERE, two auto industry sources familiar with the matter said. BMW, Audi and Mercedes agreed in August to pay 2.5 billion euros ($2.8 billion) to buy HERE, Nokia's mapping business, as part of plans to develop self-driving cars. Renault and automotive supplier Continental have both expressed interest. Continental said on Thursday a decision on whether to buy a stake in HERE would be made within the next few months. Ford is also among the companies interested in taking a stake in the HERE consortium, a third auto industry source said on Thursday.